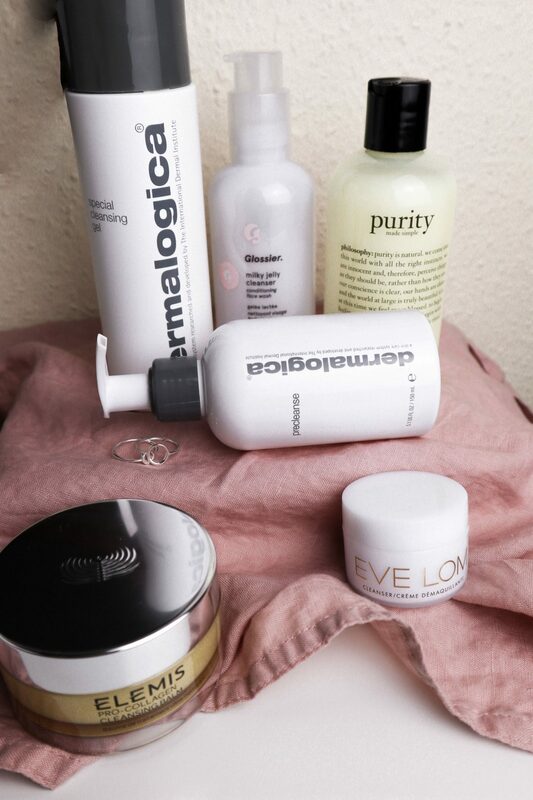 You know cleansing your face is like super important. But are you doing a good enough job? Are you using makeup wipes? Please say no! If you are, it’s not too late to stop – they are not a friend of the environment or of your skin, so keep a pack for when you’re on the plane and bin the rest. I suggest you look into double cleansing. It is an old, old ritual, which originated in Japan and slowly worked its way in the western world.Today, it’s one of the most popular techniques to washing your face, and it really isn’t rocket science. Here’s everything you need to know about double cleansing. So what is what is double cleansing? It is literally cleansing your face twice by using two different products. Usually with an oil-based cleanser first, followed by a water-based one. Easy-peasy. When you double cleanse, you will get rid of all makeup, sunscreen, airborne bacteria, pollution and sebum buildup, and all these can lead to premature skin ageing, pigmentation and breakouts. No thanks. Do I need to double cleanse if I don’t wear makeup? This simple answer to this question is yes. Even if you’re not wearing makeup, you’d still have sunscreen on, and your skin would have been exposed to pollution and sweat. 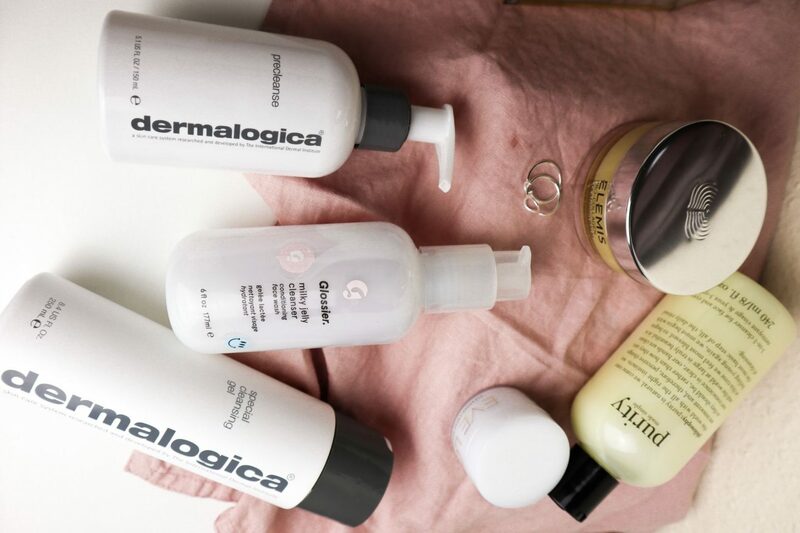 All of these need to go before you move on to the next steps of your skincare routine, so that they work, but also so that your skin stays healthy. Imagine a white shirt, if you don’t wash it well, you’ll end up with stains all over it. Same with your face. Double cleansing does a great job at removing all impurities, and leaves you with clean, fresh skin, which will absorb your night treatment a lot better. However, it is important to make sure you are not over-cleaning your skin. If you feel it’s getting dryer or sensitive, try switching to gentler products. If it doesn’t help, lay off double cleansing for a bit and consult with your dermatologist. Never stick with something that irritates your skin, as you might cause serious damage. 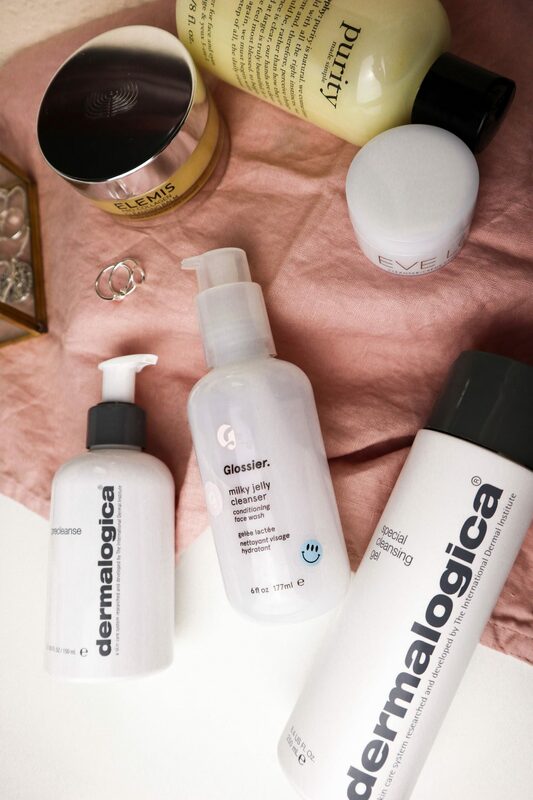 What do the different cleansers do? As I mentioned earlier, you’ll need two products with different formulas. The first one would ideally be an oil cleanser which will dissolve all the makeup, excess sebum and daily grime. Sebum is the ‘bad’ oil our skin produces. In moderation, it is essential to the skin’s health as it contains the antioxidant vitamin E, but if it builds up it acts like pore glue. It will attract all impurities and keep them on your skin, which is not what you want. But beware! If you attack sebum with harsh products, your skin will start overproducing it, which will lead to it being oily and breaking out. So here’s where the oil cleanser comes to play. It will lift away excess sebum without completely drying out the skin for a healthy balance. The next step is a water-based cleanser which will get into those pores and really clean them up. Use a light gel or cream after as a second cleanse, and make sure you massage it into the skin well. As you have already broken down the oil barrier, so the lathering product and water will clean deep into the pores to remove water-based impurities like sweat and environmental pollution. It is important to apply the cleansing oil with dry hands on dry skin because otherwise the oil will emulsify with the water too soon and it won’t be as effective. Because of the orientation of follicles on the face, it’s best to apply your cleansing products with upwards and outwards movements, in order to get a good, deep cleanse. Massage the cleanser for about a minute and then remove with a muslin cloth or water for the oil-based product and with water for the foaming one. Never use too cold or too hot water, because extremes can cause irritation. Go for a pleasant lukewarm temperature and don’t pull the skin too hard. When your face is clean, you are ready to proceed with your favourite night treatments and wake up to your bests skin ever. How to pick my products? There’s SO much to chose from, and really it depends on what you like / what works with your skin. I’ve recently made a decision to buy mini-sized versions of (expensive) products I want to try so that I don’t end up wasting money on something that I may or may not like. If I love it, then I’ll move on to splashing the cash (that I don’t have). 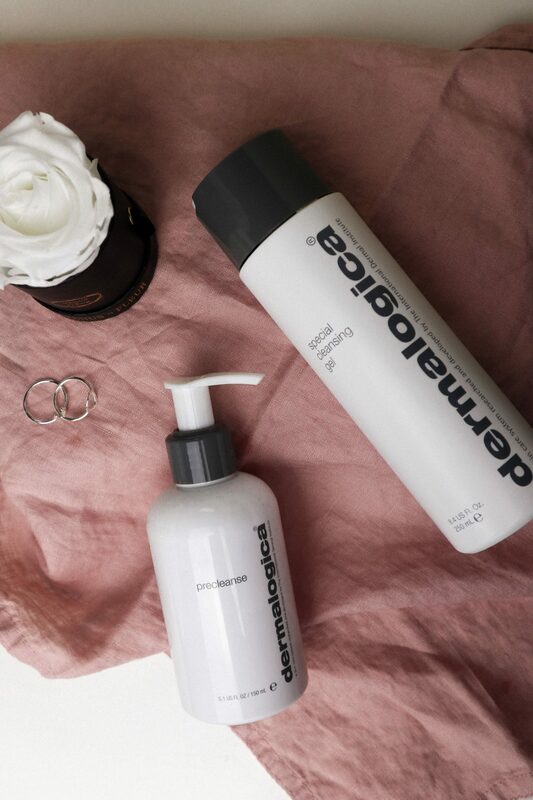 The duo I’m currently using is from Dermalogica. 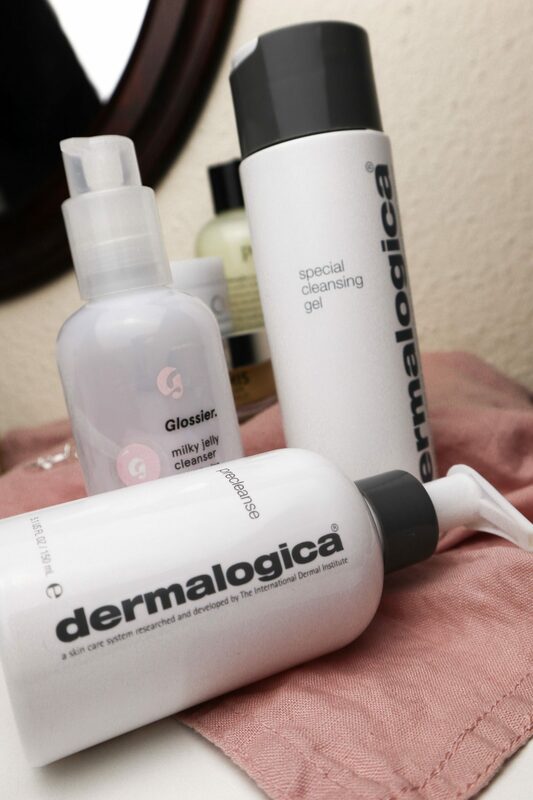 I start with the with the Dermalogica Precleanse*, which I have recommended to anyone who’d listen. I’m in love with this oil. It melts makeup instantly, so it’s a must for the rare occasions I put it on. But it’s also very gentle, smells soooo nice thanks to the apricot oil that’s in it and I need the tiniest bit to clean my face, so it will last for a while. Then I use the Dermalogica Special Cleansing Gel*, and I’m very happy with it. It is very gentle, and while it leaves my skin feeling clean, it doesn’t dry it out or irritate it. My face doesn’t feel tight or dehydrated after I’m done washing it, which means this is a winner combination for me. Two cleansing balms I have in my ‘to try’ pile, are the ELEMIS Pro-Collagen Cleansing Balm (you know I love my Elemis products) and the cult EVE LOM cleanser. Both are pricey, so I really really hope they work well! They are also both are balms, so it’s probably a good idea to try them now while I have short nails, or just buy a little spatula, because I hate it when products get under my nails. Not fun. I will report when I have observations and thoughts on them! For a second cleanse, you know I love the Glossier Milky Jelly Cleanser. If you didn’t know, look at this almost empty bottle. It’s a sign of a loved product. I wasn’t 100% sold on the slight rose scent, but it’s actually very subtle, so I got over it, as I actually really enjoy the texture of the cleanser and how it works. The Garnier Micellar Gel face wash, which I sometimes use, is a good budget option. It’s nice and gentle, and a great morning cleanser. Another product I’ve been meaning to try for ages is the Philosophy Purity Face Wash*, and I promise I will do soon because I’ve heard great stuff about it. I’ll report when I finally start using it. Aaaand that’s all I have for you today. Do you double cleanse, and if so, what products do you use? Let me know in the comments! This post contains PR samples. Products marked with * have been kindly sent to me for consideration but I have been under no obligation to feature them in a blog post. All views & images are my own.